If you are looking for quick and easy you’ll love this beef taco skillet dinner. Ground beef is simmered with fresh vegetables, corn tortillas, and seasonings to give you big Tex-Mex flavor in less than 30 minutes. I thought so. We live in a busy society and if you’re anything like me you barely have time to get a shower let alone spend hours on dinner most nights of the week! Oh, there are times when I have some extra time, or I carve out extra time for something special but most days I get dinner on the table in less than an hour — and a lot of the time I have less than 30 minutes. It’s times like that when ground beef and an iron skillet are your best friends! This dinner is one dish — goes from stovetop to table easily. If you prep your onions and green peppers on the weekend (or buy them precut at the store) there is hardly any preparation time. Add a salad and maybe this microwave Mexican Chocolate Cobbler and you’ve got a real dinner on the table in less time than it takes you to pick out a pair of shoes. I mean, less time than it takes me to pick out a pair of shoes. It’s odd really. I love shoes but only when I am going out. I rarely wear them around the house or yard and when I was a kid I never wore shoes in the summer. Flip-flops were fine most of the time and I had a pair of black and red cowboy boots that I wore the rest of the time… unless my mom forced me to wear the patent leather mary janes (black until Easter, white until Labor Day). Apparently those boots were so near and dear to my heart that no other shoes in the entire shoe store fit my feet (according to me) and my dad saw no reason not to buy them. Here’s the real kicker though – now I don’t own one pair of cowboy boots but my husband has rather a large collection. And by large I mean more than 10 pair. What can I say? When I see cowboy boots I have to have them… and in this case the man that was in them, too! 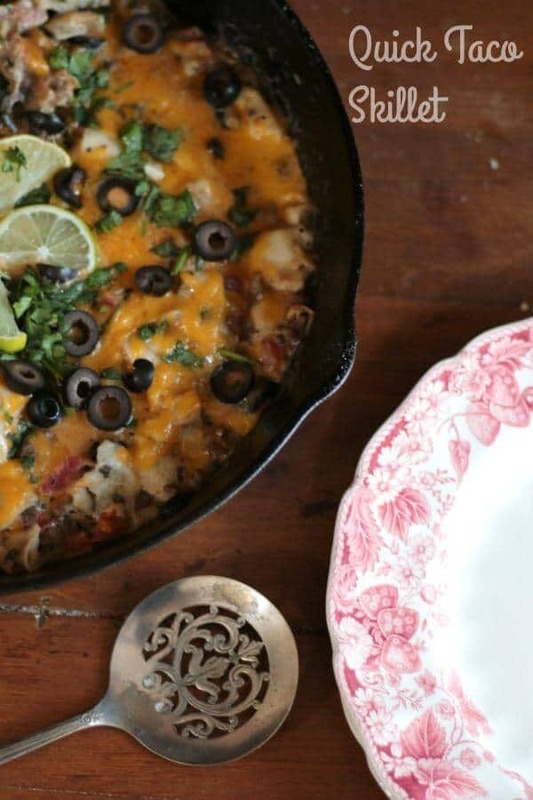 So, feel free to kick off your shoes and get comfortable while you are cooking this beef taco skillet dinner. Put on your favorite music, take a deep breath, and forget about the stupid meeting you’ve got in the morning. I’m trying to learn to live in the moment because I am quite sure that I will be ever so much happier if I do. When a meal is as easy as this you can put the stress back in your computer case and enjoy the evening. The stress will wait until tomorrow. This is completely versatile. You can add corn if you want to, top it with avocado, or just use beans rather than the beef and make it vegetarian. I’ve done that and I promise it’s yummy no matter how you make it! If you don’t have an iron skillet you can’t go wrong with a Lodge 12″ Cast Iron Skillet! Here’s that beef taco skillet dinner recipe! When you make it snap a picture on Instagram and tag it #restlesschipotle. I love to see what you’ve made! A quick and easy beef taco skillet dinner that goes from stovetop to table top in less than 30 minutes. Hearty and satisfying, it's definitely a family favorite. Add the ground beef to a large (12") iron skillet that has been heated for about 3 minutes. Add salt and pepper to the meat and cook it for about two minutes. Add the onion, bell peppers, and jalapenos. Saute until the beef is cooked through and the vegetables have softened. Add the olives, tomatoes, pinto beans, cumin, garlic powder, cilantro, and tortillas. Simmer, stirring occasionally for 5 minutes or until the tortillas have softened and the dish is heated through. Top with the shredded cheese, cover and turn off the heat. Leave on the stove for a few minutes until the cheese melts. Serve with lime wedges to squeeze over the top. Yes, me! I hated Easter as a kid for those damn dresses and uncomfortable shoes!! This looks like such a perfect easy dinner – right up my alley! 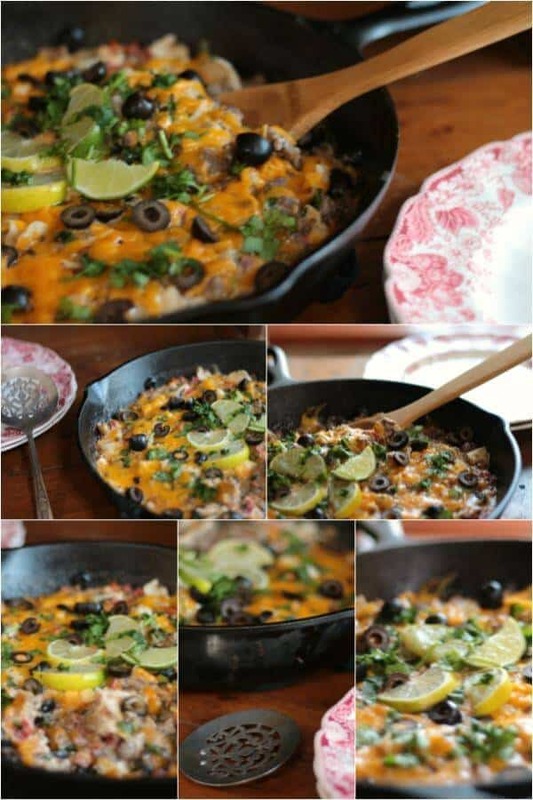 My kids are pretty much obsessed with tacos but I’ve never had a taco skillet before, from the looks of this recipe I must be missing out! You really are! I love them. What a great weeknight dinner. My family will love this!! It really works for a quick dinner! My family loves it. Marye, I love this recipe. I’m on a big comfort food kick (eagerly awaiting warmer weather!) and this looks perfect to add to our week’s menu line-up. Thank you! Hi Merye…. I always love your exotic recipe ideas.. It’s so healthy yet yummy one! LOL! I don’t know about exotic… but thank you!